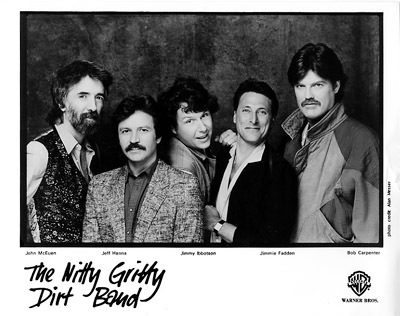 The Nitty Gritty Dirt Band returned to their country roots in 1982, around the time the band started using their full name again. They had a lineup change as well, with former member Jimmy Ibbotson joining Jeff Hanna, Jimmie McFadden, and John McEuen for the sessions taking place in Nashville. With Norbert Putnam and Richard Landis producing, Let’s Go was released on Liberty Records in 1983. The album, which peaked at #26, had two successful singles. “Shot Full of Love,” written by Bob McDill reached #19. While not overwhelmingly country, the track worked in the Urban Cowboy era of smooth country-pop and was nicely driven by the band’s excellent harmonies. Ibbotson wrote “Dance Little Jean,” an excellent mid-tempo acoustic guitar driven number in hopes it would convince his ex-wife they should reconcile. The plan backfired although she’s reported to say he could afford to pay child support (the Jean of the song referred to the couple’s daughter), as the track would be a hit. Her prediction was correct and the song rose to #9. The remainder of the album was peppered with tracks penned by notable songwriters. Rodney Crowell wrote “Never Together (But Close Sometimes),” a Caribbean flavored number accentuated with steel drums and an island beat that are horribly dated today. Pop singer-songwriter Andrew Gold contributed “Heartaches In Heartaches,” an excellent mid-tempo number notable for a rocklin’ beat. Dave Loggins composed “Goodbye Eyes,” a tender soft-rock ballad that would’ve been a perfect crossover hit had it been a single. And finally, Marshall Crenshaw inscribed “Maryann,” a synth-heavy ballad with a fuller arrangement than most of the tracks, but still perfectly Nitty Gritty Dirt Band. Hanna co-wrote “Special Look,” a very good synth drenched number with Bob Carpenter. He and Fadden collaborated on the title track, a number that wouldn’t have been out of place in Alabama’s catalog at the time. “Don’t Get Sand In It,” isn’t country at all, but from a pop/rock perspective, it’s still good. “Too Many Heartaches in Paradise” leans more into country music from the era and would’ve been a good choice as a single. As a whole, Let’s Go isn’t a country album and to categorize it as indicative of the Urban Cowboy era is a stretch. But the band is in fine form throughout, with clean arrangements and harmonies that may be dated today, but are still very listenable. Is it folk or rock or country? Lots of people have had that question about the Nitty Gritty Dirt Band. The answer, of course, is all of the above, with the band’s origins lying in the roots scene of 1960s California, but their greatest strength has been as a country rock band in the 1980s, and in the role bringing together country heritage with younger performers and listeners in the Will The Circle Be Unbroken trilogy. The band was founded in the 1960s in Long Beach, California, by Jeff Hanna, as a folk-rock jug band. The first members included Jimmie Fadden and singer-songwriter Jackson Browne (soon replaced by John McEuen). Hanna, Fadden and McEuen are still members today, although the lineup has seen a long list of changes. They soon signed to Liberty Records and from 1967 released a series of folk-rock albums. Jimmy Ibbotson joined the group in 1970, and the four plus Les Thompson recorded their most country influenced effort to date, Uncle Charlie And His Dog Teddy. They really made their mark on country music, and a place in country music history, with the ground-breaking and legendary Will The Circle Be Unbroken in 1972. The genre has always balanced change with reverence for its heritage, but by the early 1970s the oldest artists were no longer at the forefront. The triple album – a rarity at the time – revived many classic and oldtime country songs, and collaborated with veteran artists including Mother Maybelle Carter, Roy Acuff, and Earl Scruggs among others. They were still not a straight country group, playing for rock audiences much of the time. In 1975 Ibbotson left the band, and they changed their name to the simpler The Dirt Band, adopting a more rock and pop direction, although they continued to record some country songs like Rodney Crowell’s ‘Voila An American Dream’, which was a pop hit for the band in 1980. Reverting to the Nitty Gritty Dirt Band name in 1982, the core group of Hanna, McEuen, Ibbotson and McFadden made a concerted bid for the country mainstream. They enjoyed immediate success with the single ‘Dance, Little Jean’ becoming their first top 10 country hit. After their first mainstream country record they transferred to Warner Brothers Records. They were rejoined in 1983 by Bob Carpenter, who had been with them for a while in the late 70s, and for a few years Bernie Leadon of the Eagles took the place of McEuen. At the height of their success, the neotraditional sound was sweeping country airwaves. it was the ideal moment to revisit the legendary Will The Circle Be Unbroken. Recruiting some more recent stars alongside survivors from the original, Will The Circle Be Unbroken Volume II was a tour de force, winning two Grammy Awards and the CMA Album of the Year. A third instalment would following 2002. Their commercial appeal faded a little in the 1990s, and they wandered between labels, issuing material on MCA, Capitol, Liberty, DreamWorks and independent labels. They are still active touring – appearing at the Hardly Strictly Bluegrass festival in California on 5 October, and in Canada the rest of the month. They released their last album to date in 2009. We’re happy to announce they will be our Spotlight Artists for this month. We will be focussing on their mainstream country period.